Furnx sources high quality products from a range of business furniture manufacturers as part of the Rapidline brand of furniture. To ensure our products maintain high international standards we maintain a commitment to purchase accredited products wherever possible. The below recognised certification testing applies to products in the Rapidline range where labelled on each product page with the appropriate certification logo. Each certification body below explains in more detail the standards a product must adhere to in order to achieve certification. Most certified office swivel chairs in Australia and New Zealand are tested to the requirements of AS/NZS 4438:1997 – Height Adjustable Swivel Chairs. This standard of chair is recognised as being suitable for users up to approximately 110kg. Each of our chairs will have an individual weight rating here necessary on the relevant product specification sheet. 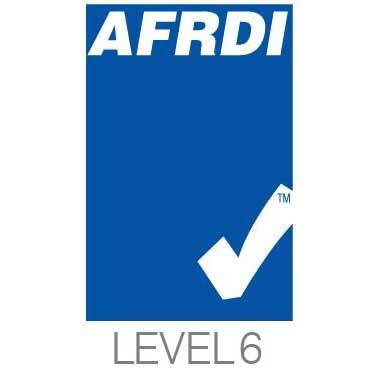 Chairs accredited with an AFRDI Level 6 logo will suit most commercial needs. AFRDI Level 6 certified chairs are able to withstand heavy duty use. BIFMA is accredited by, and their standards conforming to, requirements by the American National Standards Institute (ANSI). The BIFMA Engineering Committee develops the standards and continually drafts and revises new protocols for manufacturers to follow. The BIFMA standards are to provide manufacturer’s and users with a common basis for evaluating safety, durability, stability and structural quality of specified furniture.